Cuenca, in the Castilla-La Mancha region, is on the high-speed AVE train line from Madrid to Valencia, which makes it a perfect stop on the way from Spain's capital to its third biggest city, spending the day in Cuenca and finishing up with a paella in the city where it was invented. It is also a convenient day trip from Madrid. Cuenca has two train stations - the one for the high-speed trains (called Estación de Cuenca-Fernando Zóbel) and the station for the slower trains, (simply called Estación de Cuenca). Unfortunately, Fernando Zóbel station is 6km outside the city center. To reach the city center you'll need to find the bus or take a taxi. Despite this hassle, the high-speed train is much faster than the slow train so it is still worth taking this if you can. Journey times on the high-speed train are under an hour, with departures throughout the day in both directions. Tickets can be as low as 16 euros but are usually at least double that. The high-speed train arrives at the out-of-town station (see above) in Cuenca and departs from Atocha train station in Madrid. There is also the slow train from Madrid to Cuenca which takes around three hours. This departs from Chamartin station. The Avanza bus company runs frequent buses to Cuenca from the Mendez Alvaro bus station. The journey takes two to two-and-a-half hours. There are also buses from Toledo to Cuenca, but only when the university is running. Check at the local bus station. The best way to get from Valencia or Alicante to Cuenca is by the AVE train. Prices vary greatly. The journey should take about one hour, while the slow train takes nearly four hours! 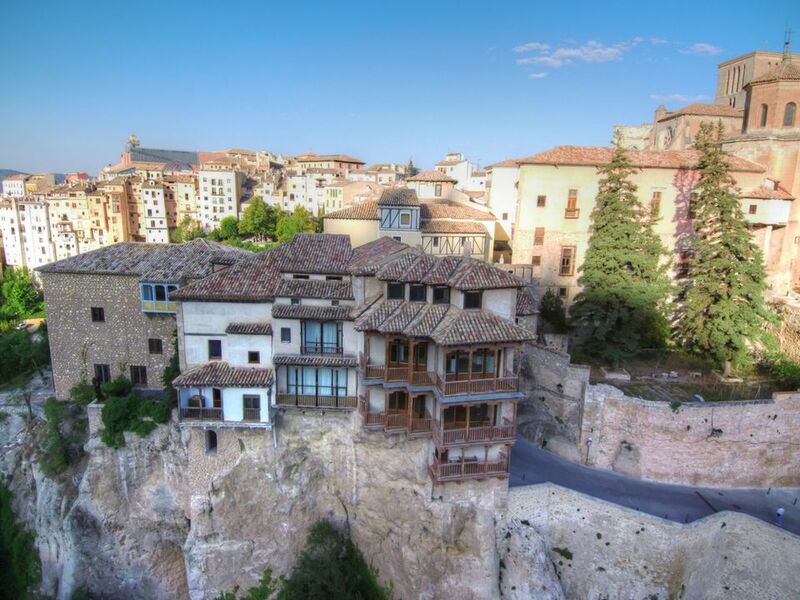 Hanging Houses: The Casas Colgadas are the most famous sights in Cuenca. The buildings, one of which features the Museum of Abstract Arts perch on the edge of steep cliffs. Contemporary Art Museum: The second reason for modern art fans to visit Cuenca. El Castillo: The remnants of an Arab fortress. The Mangana Tower: The ever-changing Mangana Tower has been rebuilt a number of times over the centuries. Its origins are unclear. Excellent paella: The Posada Real de Santa María's paella was named the best paella in the world at the 53rd International Paella Competition in 2013. Cathedral: Neo-gothic and French influence in the city cathedral. Serrania de Cuenca Natural Park: Take a tour bus out into nature.